The dsp.CICInterpolator System object™ interpolates an input signal using a cascaded integrator-comb (CIC) interpolation filter. The CIC interpolation filter structure consists of N sections of cascaded comb filters, followed by a rate change by a factor of R, followed by N sections of cascaded integrators. For details, see Algorithms. The NumSections property specifies N, the number of sections in the CIC filter. The InterpolationFactor property specifies R, the interpolation factor. The getFixedPointInfo function returns the word lengths and fraction lengths of the fixed-point sections and the output for the dsp.CICInterpolator System object. You can also generate HDL code for this System object using the generatehdl function. Create the dsp.CICInterpolator object and set its properties. cicInterp = dsp.CICInterpolator creates a CIC interpolation System object that applies a CIC interpolation filter to the input signal. cicInterp = dsp.CICInterpolator(R,M,N) creates a CIC interpolation object with the InterpolationFactor property set to R, the DifferentialDelay property set to M, and the NumSections property set to N.
cicInterp = dsp.CICInterpolator(Name,Value) creates a CIC interpolation object with each specified property set to the specified value. Enclose each property name in single quotes. You can use this syntax with any previous input argument combinations. Factor by which the input signal is interpolated, specified as a positive integer. Differential delay value used in each of the comb sections of the filter, specified as a positive integer. For details, see Algorithms. If the differential delay is of built-in integer class data type, the interpolation factor must be the same integer data type or double. For example, if the differential delay is an int8, then the interpolation factor must be an int8 or double. Minimum section word lengths – Specify the output word length through the OutputWordLength property. The object determines the filter section data type and the output fraction length that give the best possible precision. For details, see getFixedPointInfo and cicInterpOut argument. Specify word lengths – Specify the word lengths of the CIC filter sections and the object output through the SectionWordLengths and OutputWordLength properties. The object determines the corresponding fraction lengths to give the best possible precision. For details, see getFixedPointInfo and the cicInterpOut argument. This property applies when you set the FixedPointDataType property to one of 'Minimum section word lengths', 'Specify word lengths', or 'Specify word and fraction lengths'. 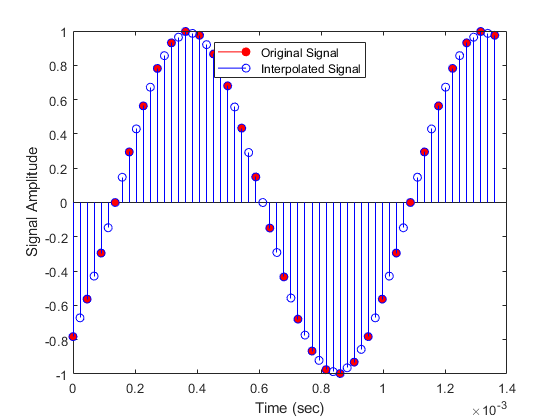 cicInterpOut = cicInterp(input) interpolates the input using a CIC interpolator. Data input, specified as a vector or matrix. If the input is of single or double data type, property settings related to the fixed-point data types are ignored. Interpolated output, returned as a vector or a matrix. The output frame size equals (InterpolationFactor) × input frame size. The complexity of the output data matches that of the input data. If the input is single or double, the output data type matches the input data type. WLinput and FLinput are inherited from the data input you pass to the object algorithm. For built-in integer inputs, the fraction length is 0. When the FixedPointDataType is set to 'Specify word and fraction lengths', the output word length and fraction length are the values you specify in the OutputWordLength and OutputFractionLength properties. For a list of filter analysis methods this object supports, type dsp.CICInterpolator.helpFilterAnalysis in the MATLAB® command prompt. For the corresponding function reference pages, see Analysis Methods for Filter System Objects. Create a dsp.CICInterpolator System object™ with InterpolationFactor set to 2. Interpolate signal by a factor of 2 from 22.05 kHz to 44.1 kHz. Create fixed-point sinusoidal input signal of 512 samples, with a sampling frequency 22.05 kHz. Interpolate the output with 64 samples per frame. Plot the first frame of the original and interpolated signals. Output latency is 2 samples. The CIC interpolation filter increases the sample rate of an input signal by an integer factor using a cascaded integrator-comb (CIC) filter. R is the interpolation factor. The filter H(z) in Definitions is realized as an interpolation filter when N sections of cascaded comb filters are followed by a rate change by a factor R, followed by N sections of cascaded integrators. This diagram shows two sections of cascaded comb filters and two sections of cascaded integrators. The unit delay in the integrator portion of the CIC filter can be located in either the feedforward or the feedback path. These two configurations yield identical filter frequency response. However, the numerical outputs from these two configurations are different due to the latency. This block puts the unit delay in the feedforward path of the integrator since it is a preferred configuration for HDL implementation. The fixed-point signal diagram shows the data types that the dsp.CICInterpolator object uses for fixed-point signals.